Global Access Initiative| Hologic, Inc. Imagine a world where universal access to quality diagnostic testing and viral-load monitoring for the most prevalent viral diseases are available everywhere, for everyone. The vision is simple, but translating it into tangible results can be challenging in resource-limited settings. As a leading provider of medical diagnostics, Hologic is working towards making this a reality. 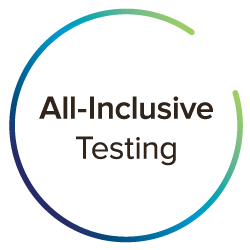 The Global Access Initiative is our solution to promote simple, scalable and sustainable access to cost-effective and quality diagnostic testing for countries that need it most. This program creates an accessible pathway for healthcare in resource-limited settings, where financial and operational challenges can create barriers to care. It was designed to help countries overcome these barriers so their citizens can access crucial testing. * Testing services do not include ancillary costs, for example those associated with sample collection, sample transport, laboratory staff time, laboratory infrastructure, generic lab supplies (e.g., primary collection tubes, disposable gloves, bleach, bleach bottles, bleach enhancer, waste bottles), inventory management, or general administration and overhead costs. † Replacement tests for one set of controls and calibrators per kit and documented instrument errors. Hologic supports the 2030 UNAIDS 95-95-95 treatment target to help end the AIDS epidemic through HIV detection and antiretroviral therapy, with the end goal of viral suppression for infected patients. The Global Access Initiative continues this support and expands this reach to include other common viral targets. Aptima® HIV-1 Quant Dx assay – Aids in the diagnosis, confirmation and clinical management of HIV-1 infection. Now WHO prequalified. Aptima® HCV Quant Dx assay – Aids in the diagnosis, confirmation and clinical management of HCV infection. Aptima® HBV Quant assay – Aids in the clinical management of HBV infection. In resource-limited settings, 1 in 2 women with HIV-1 are co-infected with high-risk HPV, and an estimated 5 million people are co-infected with HIV-1 and HCV.3,4 With a single instrument and a multitude of available viral targets, the Global Access Initiative helps providers address the diagnostic and viral-load testing needs of patients with or at risk of coinfection. At Hologic we are committed to creating sustainable pathways for testing in areas where access to healthcare can make all the difference. Click on the links below to learn more. *Not all assays are available in every country. References: 1. Calmy A, et al. HIV Viral Load Monitoring in Resource-Limited Regions: Optional or Necessary? Clin Infect Dis. 2007;44(1):138-34. doi: 10.1086/510073. 2. UNAIDS. Understanding Fast-Track: Accelerating Action to End the AIDS Epidemic by 2030. http://www.unaids.org/sites/default/files/media_asset/201506_JC2743_Understanding_FastTrack_en.pdf. Pub­lished June 2015. Accessed October 22, 2018. 3. Vuyst HD, et al. Prevalence and determinants of human papillomavirus infection and cervical lesions in HIV-positive women in Kenya. Br J Cancer. 2012;107(9):1624-1630. 4. The Global Fund. Global Fund and Hepatitis C Treatment. The Global Fund Thirty-Second Board Meeting; November 20-21, 2014; Montreux, Switzerland. 5. Lecher S, et al. Scale-up of HIV Viral Load Monitoring – Seven Sub-Saharan African Countries. MMWR. 2015;64(46):1287-1290.